Home Blog Posts Let’s end US travel and trade restrictions that harm the people of Cuba and the US! In April of 1960, State Department officials wrote that the goal of the U.S. embargo of Cuba was “…to bring about hunger, desperation and overthrow of the government” (State Department, April 6, 1960). Today the Cuban people still experience shortages of many essentials including life-saving medicines and medical products. When we meet with our legislators in DC or in district we advocate for policies that benefit the people of our two countries. Even though polling shows that 96% of Cubans living on the island support lifting the trade embargo and have said that more tourism would benefit the local economy, President Trump announced in 2017 that “in solidarity with the Cuban people” the U.S. would add more barriers to trade and travel to Cuba. Since polling has also shown that 63% of Cuban-Americans in Miami-Dade County oppose the continuation of the embargo and 73% of people in the U.S. favor ending the embargo we have to ask who is in favor of these restrictions? CRLN has worked with faith communities in Cuba and the U.S. for more than twenty years to end harmful U.S. policies, believing that the human rights of Cubans and the people of the US would best be served by lifting all travel restrictions and finally ending the embargo. S.428 – The Freedom to Export to Cuba Act of 2019 — A bill to lift the trade embargo on Cuba. U.S. Senators Amy Klobuchar (D-MN), Mike Enzi (R-WY), and Patrick Leahy (D-VT) reintroduced major legislation to lift the Cuba trade embargo. The bipartisan Freedom to Export to Cuba Act (S428) would eliminate the legal barriers to Americans doing business in Cuba and pave the way for new economic opportunities for American businesses and farmers by boosting U.S. exports and allow Cubans greater access to American goods. The legislation repeals key provisions of previous laws that block Americans from doing business in Cuba, but does not repeal portions of law that address human rights or property claims against the Cuban government. U.S. and Cuban faith communities have long advocated for the lifting of the embargo because of the suffering it causes in Cuba. We are also asking legislators to urge the State Department to process visas for Cubans in Cuba. The Trump Administration ordered staff reductions at the US Embassy in Havana, Cuba and at the Cuban Embassy in Washington, DC in response to health issues experienced by some personnel at the US and Canadian Embassies in Havana. Now all staff that would issue visas to Cubans to visit the U.S. have left the Embassy. The FBI did not find any evidence linking the health issues to actions by the Cuban government during its three visits to the island and the investigation is ongoing. Now Cubans who want to get visas for tourist travel or permanent reunification with their families must travel to another country to get these visas. In the past many Cubans were able to obtain visas for five years. This enabled religious leaders, scientists, artists as well as people with family in the U.S. to travel without applying for a visa each time. This five year visa has been discontinued and Cubans can only receive a visa for one visit in a three month period. The cost of plane fare, waiting in the third country to see if they can get a visa and the $160 non-refundable fee just to apply have made it financially impossible for most Cubans to apply for a visa. There must be a way to process Cuban visas in Cuba. Otherwise the U.S. has effectively created a travel ban against Cubans visiting the US for family reunification or other purposes. 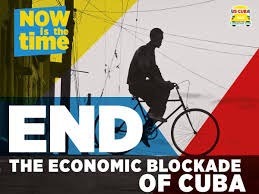 More information on S.428 – The Freedom to Export to Cuba Act of 2019 — A bill to lift the trade embargo on Cuba.